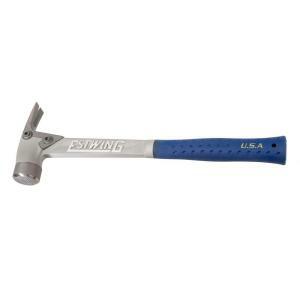 The Estwing AL-Pro Hammer is the latest in hammer design technology. Al-Pro is made from forged aircraft aluminum alloy, which is lighter than titanium. Vibration dampening shot is built into the head giving every blow the maximum force. The PERMA-CAP steel head and interlocking steel claw give this hammer durable strength where it is most needed and the reduced claw length provides increased leverage. The AL-Pro includes a magnetic nail starter in the head. The Al-Pro was engineered with the professional in mind for extended usage. It provides power in a lighter weight package, for the best performance in a hammer and comes with our patented Shock Reduction Grip. Tbook.com crawls the web to find the best prices and availability on Estwing and related Tools and Hardware products like Estwing AL-Pro Forged Aluminum Hammer. For this page, related items include products we find that match the following keywords: "Estwing" at our vendor partner Home Depot. Estwing AL-Pro Forged Aluminum Hammer is one of 156 Estwing and related products listed in the Tools and Hardware section of Tbook.com If you have any questions on this product, please give us a call at 734-971-1210 during the hours of 9am - 5pm EST for assistance. Thank you for shopping at Tbook.com, the Internet Department Store!